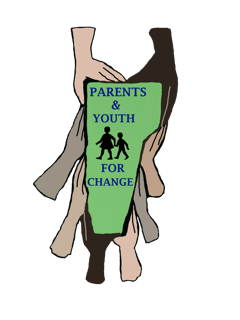 What is Parents and Youth for Change (PYC)? Meet the PYC community organizers here! Parents and Youth for Change has been organizing in Burlington and Winooski to support a student-centered approach to learning since 2011. Proficiency based learning is a way to systematically approach public education so all students will achieve at high levels without gaps among subgroups. This aligns with the state of Vermont’s Flexible Pathways Initiative or Act 77, which approaches student-centered learning by creating Personalized Learning Plans (PLPs). Parents and Youth for Change receives financial support, technical assistance, and inspiration from the Nellie Mae Education Foundation and the Center for Youth & Community Leadership in Education (CYCLE) of Roger Williams University (formerly known as the Annenberg Institute for Education Reform at Brown University). Together, the NMEF and CYCLE have provided the time and space to create safe, professional learning communities among school reform practitioners across New England. PYC organizers and members also participate in conferences and workshops around the U.S. and the globe to learn about the best practices to apply to community organizing and public school reform. PYC is one of many community organizations across the country working to redesign a public education system where learning is unique to each student’s needs. Learn more about PYC’s accomplishments here! With the goal of creating education opportunities that account for specific students needs, PYC also aims to discover power through relationship building and learning together. This process begins with members getting to know each other and identifying issues that both parents and students are affected by, and ends with securing commitments from decision makers to implement solutions. In the middle there’s lots of learning, sense making, sharing experiences, reflecting on our process, food, and laughter! Interested in how PYC organizes to make change? Learn about our organizing approach! Whether you are a student, recent high school graduate, a parent/guardian, or a concerned member of the Burlington and/or Winooski community, Parents and Youth for Change welcomes you with open arms! The easiest way to get involved is by finding time to meet with us to learn more about what your interest and concerns are. Watch the video on PYC’s Spring 2016 public action meeting! Find pictures from PYC events here!